The Dish D’Lish brand launched in 2002 by celebrity chef Kathy Casey at Seattle’s famous Pike Place Market. 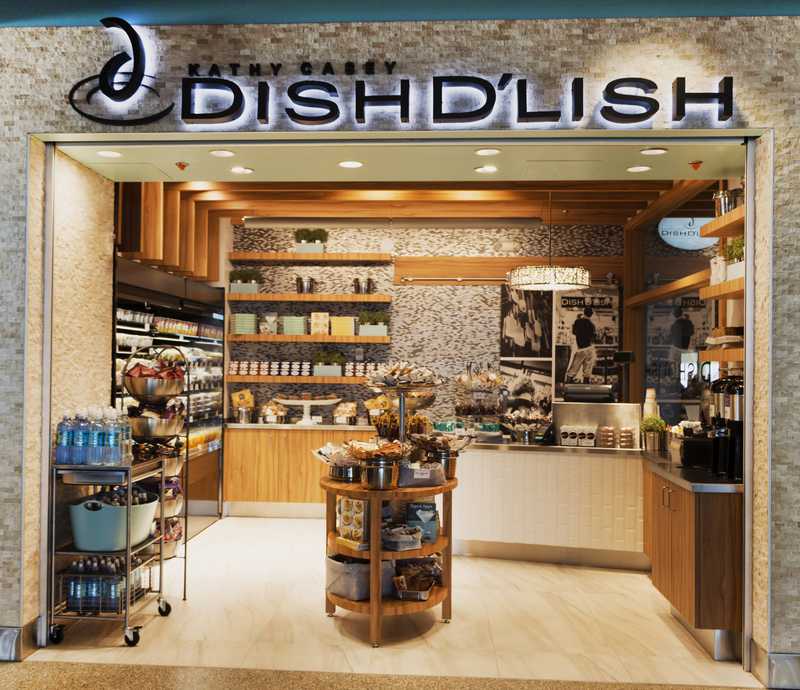 In May 2005, Dish D’Lish Food T’ Go Go® opened its first café at Sea-Tac International Airport in the Central Terminal and has been a popular stop for hungry travelers ever since! In September of 2017, we relocated to our newest spot on Concourse C.
Our menu features healthy, flavorful, and tempting selections that are ready to travel. AM favorites include Savory Egg Bites and gluten free friendly Chia Oat Berry Cups, as well as yogurt and berry parfaits and a selection of seasonal fresh fruits. Enjoy the Pacific Rim Chicken Salad with house-roasted chicken breast, crunchy veggies, and low-fat sweet and tangy sesame dressing or the Northwest Salad with roasted local pears, toasted hazelnuts, dried cranberries, blue cheese and Dish D’Lish Cranberry Vinaigrette. Popular salad cups include; gluten free friendly Mediterranean Quinoa Salad, Tarragon Chicken Salad and Zingy Cucumber which are perfect grab-and-go items making it quick and easy to enjoy a healthy meal. For sandwiches on the go, try our D’Lish Chicken made with thin sliced roasted chicken breast, Dish D’Lish Harvest Apple & Cranberry Chutney, and chive goat cheese on local organic bread. House-baked bakery items include Whole Grain muffins such as Zesty Lemon Poppy Seed and Cranberry Orange, as well as our addictive Chocolate Toffee S’more cookies. Be sure to check out our Dish D’Lish retail products such as our signature French Seasoning Salt, Cha Cha Chipotle Lime Seasoning, and our newest Rain City Seasoning blended with local Caffè Umbria Coffee and Theo Chocolate Cocoa Nibs. Our selection of Kathy Casey’s popular books are great gift items too – like Sips & Apps and D’Lish Deviled Eggs! We opened a NEW location in September of 2017 at the end of C Terminal.